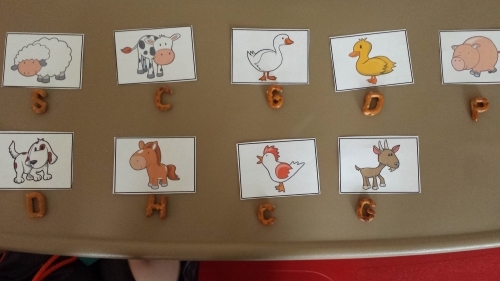 Evan has just started to recognize beginning sounds of words so I decided to use farm animals to work on this skill with him during our farm themed week of playful preschool. 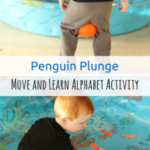 I also made it a movement activity because the boy loves to move! This week the PLAYful Preschool team is bringing you a wide assortment of farm themed activities you can do with preschoolers. 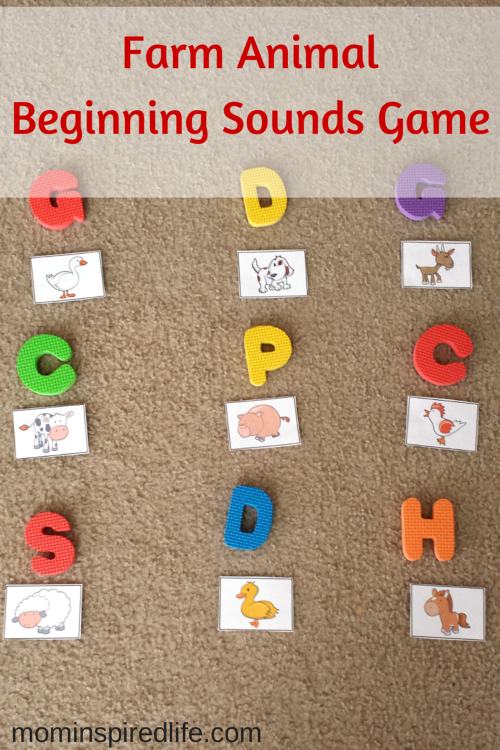 This activity will help your child work on identifying beginning sounds of words and finding the letter that makes the sound. 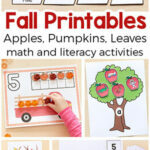 The hands-on, playful approach to this activity will have your child moving while learning as well. 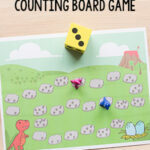 Farm animals – I printed out a free printable I found online here or you could use farm animal toys you have around the house. 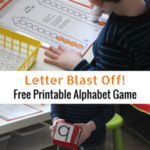 Letters – I used bath letters, but magnetic letters, puzzles pieces or even pieces of paper with letters written on them will work. 1. 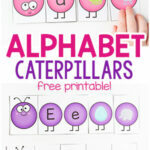 Gather farm animal toys or print them out and cut them. 3. Put letters in a pile on the other side of the room. My pile only included the letters needed to complete this activity because I didn’t want it to be too overwhelming for him. You could include all the letters in the alphabet if you wanted to increase the difficulty. The first thing I did was ask Evan pick the first farm animal he wanted to work on. He picked a cow. I then asked him what letter “cow” starts with. I also made the letter sound over and over again to give him help. He then ran over to the pile of letters and looked for the letter. In this instance, he knew the letter was “C” and he grabbed it and ran back and placed it above the cow. Many times, he still didn’t know which letter made the sound he was looking for, so he would pick one and ask me “Is this it?” and I would tell him “yes” or “no.” Once he found the correct letter, he would run back and put it above the farm animal. Evan is in the beginning stages of identifying letters by their sound, so this activity required a lot of guidance on my part. Your child may be able to do this fairly independently if they are further along in this area. From the ‪#‎PLAYful‬ Preschool Education Team! 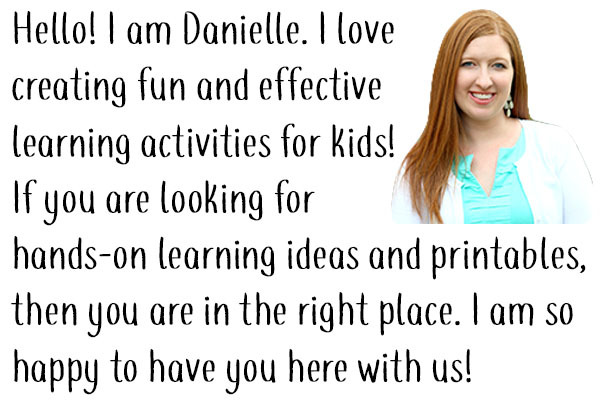 Literacy, Mathematics, Science, Art, Sensory, Songs and MORE!!!! 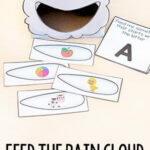 Corn Painting – An Art Activity for a Preschool Farm Theme by Fun-A-Day! We would like to extend an invitation to join us tonight at 9:00 P.M. EST for a live Google Hangout talking about the activities we are doing with our preschoolers for the farm theme. This hangout will be recorded and able to be viewed at a future date.